Baseball season has me running here, there, and everywhere. We are at practice 3 days a week with two games weekly. I try not to pick up fast food, but I will admit that at least one game a week we run out to get food since the game lasts from 4-7pm including warm-ups. This leaves me scheduling my meals for the week. I make sure to have meals prepped on practice days so that when we come home we can just warm and eat. I usually pick foods that still taste good when they are reheated. Or that can sit in the crock-pot or instant pot. This week I am excited to try this twist on chili. Everyone in my family loves Mac N Cheese, and everyone loves Chili. So, why not combine the two? Thank you to BellyFull for this fun and simple recipe. Bonus points for making it in a dutch oven because I can adapt it to cook in the instant pot. In order to cook it in the instant pot, I just made sure to brown the meat before I placed the ingredients in the Instant Pot. I am sure this one-pot chili mac will become a hit with my family since it is so simple to create and enjoy. Thank you to BellyFull for the idea. Be sure to head over to BellyFull for the full tutorial, and to see their other great recipes! 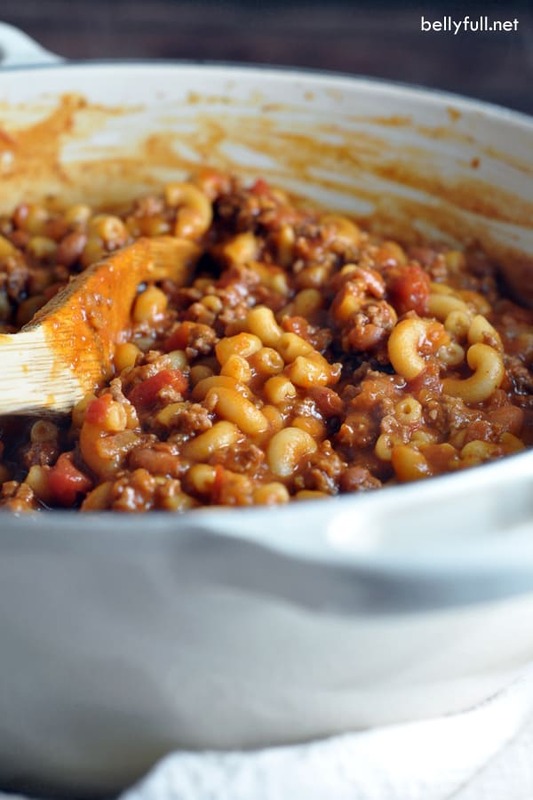 This entry was posted in Food & Recipes and tagged bellyfull, chili, chili mac, chilimac, dutch oven, easy meals, food, instant pot, mac n cheese, recipes, simple meals, the boys store on April 13, 2018 by Lacy. Now that September is here we are in full on BUSY mode at our house. Between school, soccer, work, and church activities we are home late more than three weekdays a week. This can make it difficult to create meals, sit down, and eat as a family. I must admit that at least once a week I give up and pick up food. I try to only do it the night we get home the latest. The night we have absolutely no chance of cooking and eating before the kids need to be in bed. I plan my week around that night. I know that is the one night I do not need to have a meal planned. That gives me some peace of mind so that I can make sure I am “on my game” the rest of the week. How do I stay “on my game?” I PLAN! Wednesday is my no plan night. So I make sure that I have everything else ready. I make a list of the meals for the week, on nights we will be home late I plan meals that require very little prep, and I take advantage of my Instant Pot. I LOVE my Instant Pot. It allows me to cook quickly, and not even be in the kitchen. On nights when I can be in the kitchen and can enjoy making something special, but I still stick to simple! This fun and delicious recipe from Life Made Simple Bakes is exactly what I need on those nights. 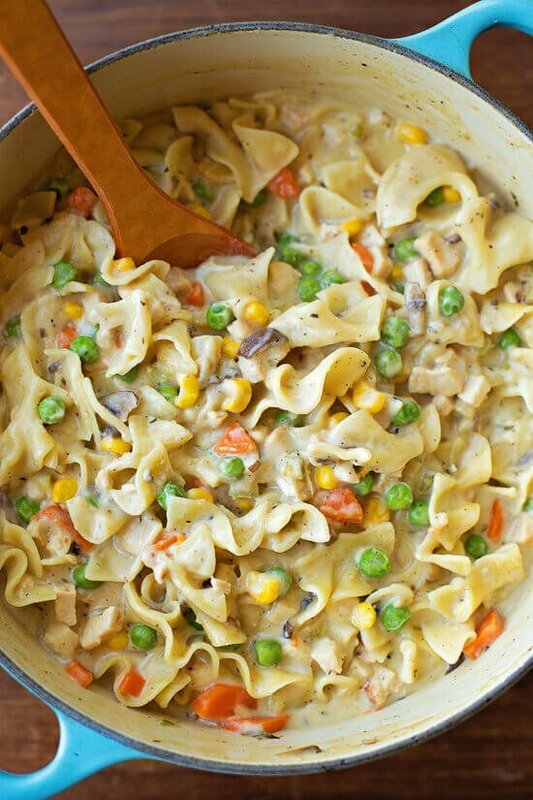 It is a delicious pasta dish that tastes like a chicken pot pie. So it tastes like I spent all day baking delicious homemade pot pies for my family, when I really only spent 30 minutes in my kitchen and made pasta. The full recipe and tutorial is available at Life Made Simple Bakes. So check it out! Remember, fail to plan, plan to fail! This entry was posted in Food & Recipes and tagged dinner, easy dinner, easy meals, food, life made simple bakes, meals, one pot dinner, one pot meals, recipes, simple meals, the boys store on September 10, 2017 by Lacy.